28 SMT Magazine • August 2014 PRINtED ELECtRONICs IN PERsPECtIVE continues very fine featured circuits possible and concur- rent with that has been a push to make im- proved inks that boast higher conductivities, an important requirement for many applications. Moreover, there have been important devel- opmental improvements in resistive and semi- conductive inks making possible the printing of transistors in addition to conductive circuit patterns. As for base materials, a wide range of ma- terials are available to match the needs of the product from inexpensive polyester for "throw away" products to ceramics used in LED light- ing assemblies. That brings us to the other half of the tech- nological equation, the markets for printed electronics. It is evident and agreed to by most industry pundits that printed electronics will never compete with the semiconductor indus- try in terms of size or manufacturing efficiency of transistors and thus cost. However, the tech- nology does have some niche applications. Cur- rent display technology is proving well suited to the technology as are certain lighting appli- cations. Another area of high interest is in photovol- taic applications with the increasing interest in alternative energy sources and printed electron- ics' potential for cost-effective mass production. 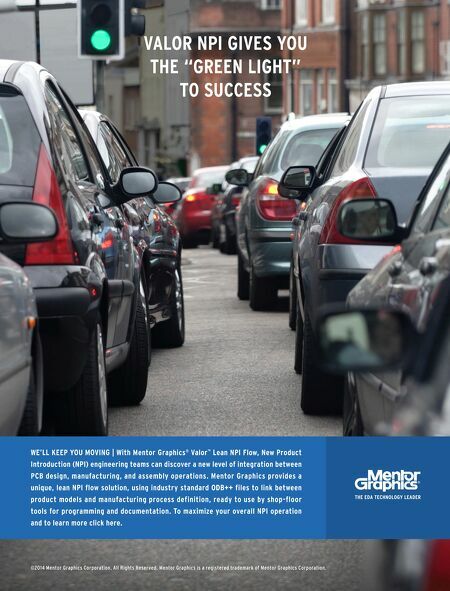 Sensors are another frequently cited area as are battery applications. Since the materials can be printed on thin flexible materials, there are also projected markets for wearable electronics. Other target markets will surely be defined and attacked as time progresses and with perhaps several dozen or more major and minor OEMs, universities, research institutes and startups in pursuit of printed electronic opportunities it is a pretty good bet that there will be more printed electronics based products in the markets and on the shelves in the future. sMt References 1. Printed Electronics World 2. Fjelstad, J., " Flexible Circuit Technolo- gy—4 th Edition," BR Publications, 2011. 3. Fjelstad, J., "Flexible Printed Electronics— Past, Present and Future," Industrial and Spe- cialty Printing April 2010. 4. Fjelstad, J., "OLEDs Shining a Whole New Light on Displays," Industrial and Specialty Printing November 2010. FEaTuRE a uCF spinout company is at the forefront of perfecting specialized nanotechnology designed to extend the longevity of batteries and super- conductors. batteries will be lighter, stay charged longer and need to be replaced less frequently--and that's a win for our smartphones and our environment. HyCarb, led by Sigrid Cottrell, recently signed an exclusive license agreement with uCF for a patented and patent-pending carbon nanotube material, developed by uCF nanotechnology researcher lei Zhai and his team. HyCarb is in the process of applying for Small business innovation research (Sbir) grants, cit- ing the licensed technology as a key component in the creation of energy storage and advanced sensor prototypes for government agencies. upon successful completion of Phase I and phase ii Sbir grants, HyCarb will work with prime contractors to supply various federal agencies with state-of-the-art energy stor- age devices and sensors to detect hazardous materials. 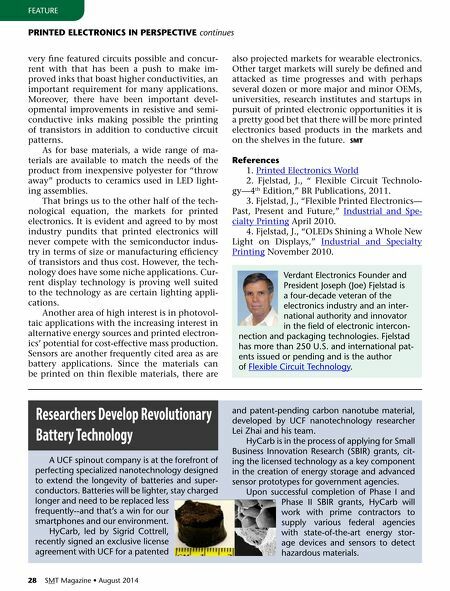 Researchers Develop Revolutionary Battery technology verdant Electronics Founder and president Joseph (Joe) Fjelstad is a four-decade veteran of the electronics industry and an inter- national authority and innovator in the field of electronic intercon- nection and packaging technologies. Fjelstad has more than 250 u.S. and international pat- ents issued or pending and is the author of Flexible Circuit Technology.